For decades, Gloria and Manville Powers put all of their energy, and financial resources, into their family. They raised seven children and nearly 400 foster children in their home in Glover. The Powers struggled for years with high electric bills, due to high use of inefficient appliances in their home. With busy schedules and the demands of raising children and contributing to their community, the Powers often struggled to make ends meet. “We chose to put our money into the children,” Gloria explained. Then, in 2016, the Powers received a home energy visit from the Northeast Kingdom Council on Aging. The purpose of the visit was to assess their energy needs and determine if there were ways in which the Council, working in partnership with Efficiency Vermont, could lower their energy bills. The visit resulted in the couple being able to dramatically cut their energy use. Through Efficiency Vermont’s Community Energy Partnership program the Powers were eligible to receive, at no cost: high-efficiency light bulbs, high-efficiency appliances (including a power-saving freezer and hot water tank), and shower heads and sink washers that reduced their hot water consumption. The first month after these improvements were installed, the Powers received an electric bill half the amount of their previous bills. 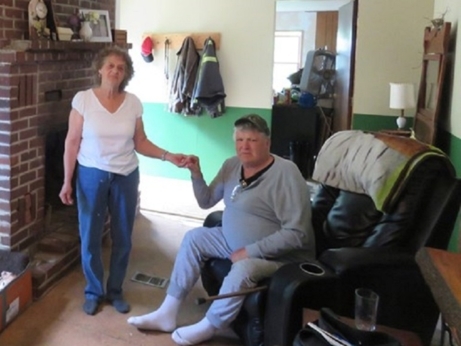 The work that Efficiency Vermont is doing with homeowners like Gloria and Manville Powers is part of our commitment to achieving energy justice for all Vermonters. Energy justice is part of the core mission of the Vermont Energy Investment Corporation, which operates Efficiency Vermont, and it is central to our work. For us, energy justice means that all Vermonters, regardless of income or background, can access clean, affordable, and efficient energy to meet their daily needs. A report recently issued by Efficiency Vermont shows that there is work to do. Mapping the total energy burden in Vermont – the ratio of spending on energy across different income levels – revealed that low-income Vermonters are spending a much higher percentage of their incomes on transportation energy than middle- and high-income Vermonters. Coupled with heating and electric energy expenses, many Vermonters are living in fuel poverty (households spending 6 percent or more of household income on energy costs). The result of this income inequality is that households in certain regions of the state, such as Rutland and Barre, are spending more than 20 percent of their annual income on energy, while in other regions, such as Shelburne and South Burlington, residents are spending less than 4.5 percent. Minimizing this inequality is good for all Vermonters. When we reduce the energy burden for the most vulnerable, we accomplish key goals: strengthening community well-being, creating cleaner air and healthier communities, and growing the Vermont economy. In practice, energy justice means implementing the types of programs that benefit families like the Powers. This includes a grant program for non-profit organizations to help low-income Vermonters lower their energy bills. This program first launched in 2014 in partnership with the Committee on Temporary Shelter (COTS), Energy Coop of Vermont, Onion River Exchange, and Capstone Community Action, helps lower-income Vermonters create more energy efficient homes. Through this program, we have completed hundreds of home energy visits, installed thousands of efficient light bulbs, completed furnace updates, and replaced old and inefficient appliances. We’re also partnering with Vermont businesses to deliver affordable, efficient energy to all incomes. We work with Vermod, a producer of zero energy modular homes, to support the replacement of mobile homes across the state. These homes are uniquely designed and sized for mobile home replacement and they produce as much energy as they consume over the course of a year. The energy they produce generally comes from solar panels on the roof or a community solar array. With incentives and special financing, these homes are affordable, durable, and hold their value over time. As Efficiency Vermont engages in this work statewide, it does more than help individuals save, it also supports our local economy. With almost 11,000 employees, energy efficiency firms are the largest employer of clean energy workers across the state. These jobs and the work Efficiency Vermont does to support this workforce through training, education, and promotions mean more opportunities in a growing industry for employees and employers. Supporting the thousands of Vermonters like the Powers, who are working hard to raise families and contribute to our communities, while struggling to afford their living costs, creates a more equal Vermont. Energy justice is not just an abstract aspiration. Our belief that reducing the energy burden for everyone, including and especially Vermont’s most vulnerable residents, is a core guiding principle of our work. To learn more about our offerings for limited-income Vermonters contact our customer support team.